The UN support role in Iraq was established by Security Council resolution 1500 (2003) at the request of the Government of Iraq, revised under resolution 1770 (2007) and has since been extended on an annual basis. The United Nations Assistance Mission for Iraq (UNAMI) is a special political mission headed by Jeanine Hennis-Plasschaert, the Special Representative of the Secretary-General for Iraq, supported by two deputies: Deputy SRSG for Political Affairs and Electoral Assistance Alice Walpole, who also leads on the issues of missing Kuwaiti and third-country nationals and missing Kuwaiti property, including the national archives, and Deputy SRSG Marta Ruedas who leads the humanitarian and development efforts in her role as Resident and Humanitarian Coordinator in Iraq. The current mandate of UNAMI encompasses, at the request of the Government of Iraq, a number of key areas, including the provision of advice, support and assistance to the Government and the people of Iraq on advancing inclusive political dialogue and national and community-level reconciliation; and on assistance to the electoral process; as well as facilitating regional dialogue and cooperation between Iraq and its neighbours; promoting accountability and the protection of human rights and judicial and legal reform; promoting gender equality; and promoting coordination and facilitating, in coordination with the Government of Iraq delivery in the humanitarian and development areas. Furthermore, under Security Council resolution 2107 (2013) UNAMI is mandated to promote, support and facilitate efforts of the Government of Iraq regarding the repatriation or return of all Kuwaiti and third-country nationals, or their remains, and the return of Kuwaiti property, including the national archives. Iraq is transitioning through three phases, beginning with an emergency response in 2014; to immediate stabilisation in 2016; followed by recovery, reconstruction, and regular development in 2018. The number of internally displaced persons has dropped to below 2 million (after a high of over 5 million). Though this is a significant achievement, planning and response must now include integration and resettlement into third locations inside Iraq. In addition to their humanitarian activities, the UN Country Team is working together to improve the lives of Iraqis across numerous sectors. Under the auspices of a United Nations Development Assistance Framework, agencies, funds and programmes are helping to rebuild agricultural systems, restructure the country’s public distribution system, support through technical advice on security sector reform and societal reconciliation, reform the social protection floor that helps millions of Iraqi families, restructure health management systems, modernize public administration, protect cultural heritage, promote quality education, and clear complex IEDs from conflict areas so that people can return to their homes. 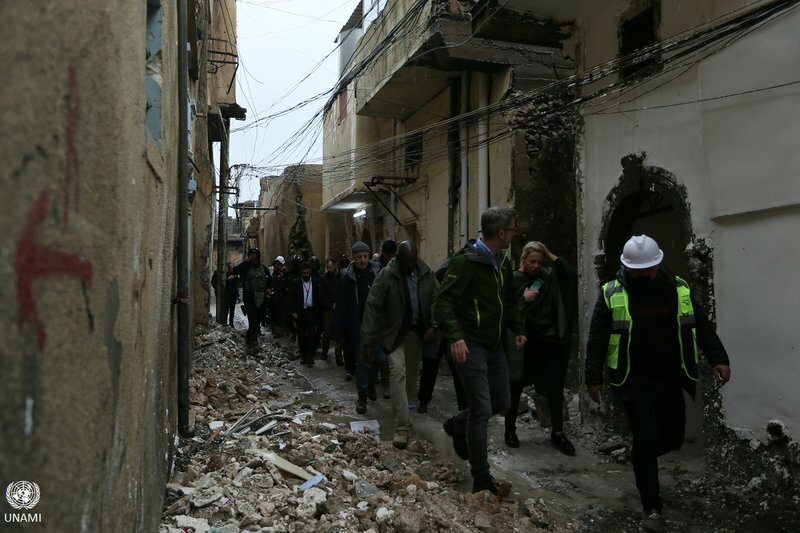 In June 2015, the Government asked UNDP to establish a Funding Facility for Immediate Stabilization (FFIS) to help stabilise areas liberated from ISIL. Using fast-track modalities, FFIS has been and is currently working in 31 areas of operation, helping the Government to quickly repair key public infrastructure, jump-start the local economy, generate income for local households, and promote societal reconciliation. UNAMI is supporting the government’s efforts to promote an inclusive dialogue on national and societal reconciliation and to help confidence-building measures to ensure the future of Iraq as a stable, federal, united and democratically inclusive state in which all of its citizens can fully and equally participate without discrimination and with equal rights and justice. UNAMI also promotes regional cooperation and dialogue between Iraq and neighbouring countries through its good offices mandate. UNAMI played a key support role in the process by which Iraqis drafted and adopted a new constitution in 2005, and assisted the country in the holding national elections as well as Iraq Governorate Council elections and parliamentary elections in the Kurdistan region of Iraq since 2009. Since the formation of the Independent High Electoral Commission in 2007, the United Nations has continued to provide technical support, policy advice and assistance to the institution. UNAMI is working with other UN partners, and all relevant stakeholders (Government, Parliament, law enforcement and civil society) to promote respect and protection of human rights in Iraq, including, inter alia, the rights of women and children and their protection from sexual and gender based violence, the rights of diverse ethnic and religious minorities, the rights of persons with disabilities, ensuring their access to basic services without discrimination, and promoting respect for the right of freedom of assembly and expression. UNAMI is also working in partnership with other United Nations, Government and civil society partners, to provide technical assistance, legal and expert advice on content and implementation of Iraq’s international human rights obligations, and on drafting legislation, regulations and policies that promote the respect and protection of human rights, and assist with building the capacity of state institutions, including relevant ministries, the Council of Representatives, the Iraqi High Commission for Human Rights, and law enforcement and the administration of justice. UNAMI in accordance with its mandate is supporting the work of the investigative team established in resolution 2379 (2017) to promote accountability for ISIL crimes in Iraq.